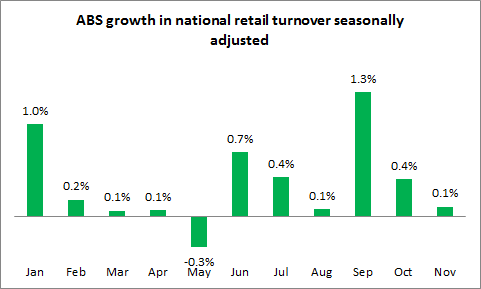 Latest ABS retail data for November reported that seasonally adjusted national retail turnover increased marginally by just 0.1 percent over the month. The November growth rate was the lowest recorded since August and is further evidence of a weakening economy. Although ABS capital city building approvals for November recorded an increase of 1.4 percent over the month, the result primarily reflected an extraordinary increase of 44 percent in speculative apartment approvals in the Melbourne property market. 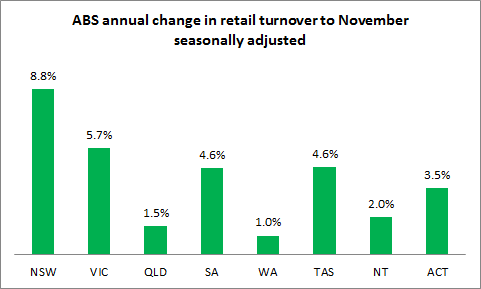 Retail sales turnover in New South Wales fell by 0.2 percent over November – the worst result for that state in 6 months. 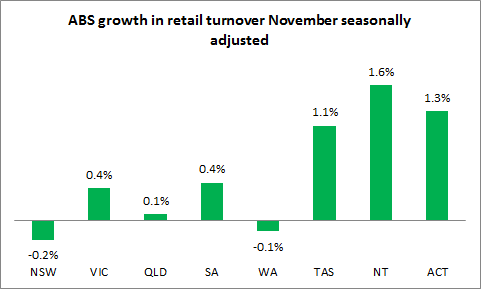 Despite the monthly fall, New South Wales retail turnover growth remains clearly ahead of all the other states increasing by 8.8 percent since November 2013. 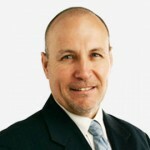 Next best is Victoria up by 5.7 percent followed by South Australia and Tasmania each with an increase of 4.6 percent in retail turnover over the year to November.